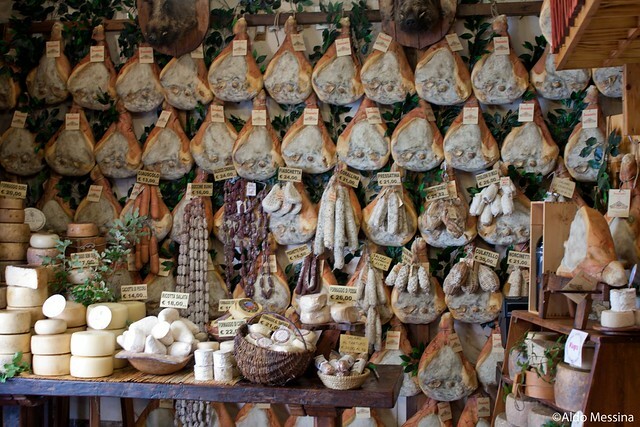 Of Italy’s iconic foods—pasta, olive oil, truffles, and wine come to mind—perhaps the most humble yet noblest among them are gli affettati, the vast array of cured pork charcuterie that unite everyone from gruff workman, pausing mid-morning to revive themselves with towering pane e prosciutto sandwiches, to chic urbanites, relaxing over an evening aperitivo accompanied by the same prosciutto elegantly wound around thin grissini breadsticks. Prosciutto Crudo di Parma, made primarily in the town of Langhirano near Parma in Emilia-Romagna,. This is the most common type of prosciutto crudo, popular for its delicate nutty and slightly sweet flavor. Prosciutto Crudo di San Daniele, from San Daniele in the Friuli-Venezia Giulia region. Even sweeter than the Parma (the cooler temperatures limit the amount of salt needed to cure the meat), San Daniele has a darker meat and is sold with the hoof still attached to the ham. Prosciutto Crudo di Norcia, from the mountains of Umbria. The saltiest of the three, prosciutto di Norcia is a good foil to the saltless Umbrian and Tuscan breads or served with sweet fruit. 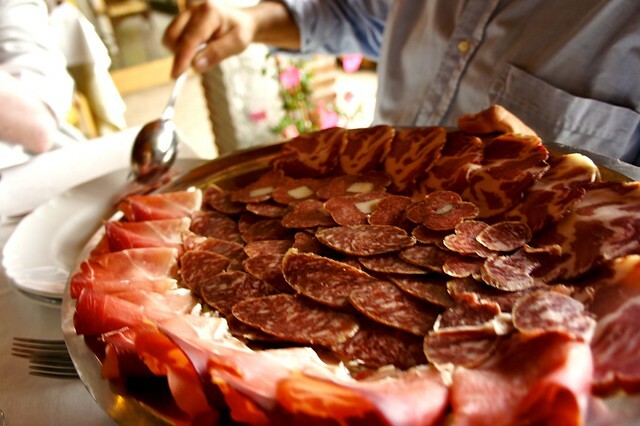 Norcia is also home to the prosciutto crudo made from the hairy haunches of local wild boar. 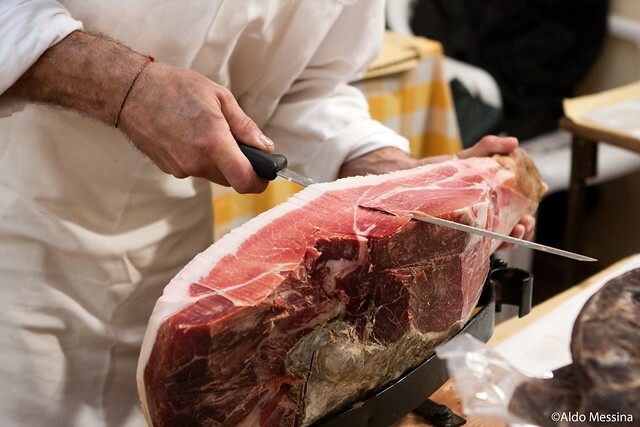 A slightly more prestigious cousin to prosciutto crudo, culatello (the most famous from Zibello in Emilia-Romagna) is the cured ham made solely from the trimmed upper haunch, leaving it with more meat and less fat. Also made from the pork leg, this specialty of the Alpine Alto-Adige region is both cured and smoked with juniper, bay, and rosemary, resulting in an incredibly aromatic final product. Known by a variety of names across Italy (including lonza, coppa, and capicollo), this cured cut of neck is salted and flavored with pepper and garlic (and sometimes fennel), at times brined in red wine, and then left to air-dry. It is sliced thinly and served much in the same way as prosciutto. Tweetable: One food that unites all Italians from gruff workman to chic urbanites is are gli affettati: Italy’s excellent charcuterie. Soppressata, of which there are two different varieties. The southern soppressata (typical of Calabria, Basilicata, and Puglia) is made of coarsely ground pork and fat and can sometimes be spiced with red pepper. The coarse texture gives the sliced salame a rustic look and cured soppressata is sometimes stored under olive oil. Instead, Tuscan soppressata isa cured gelatinous terrine-like product similar to head cheese. 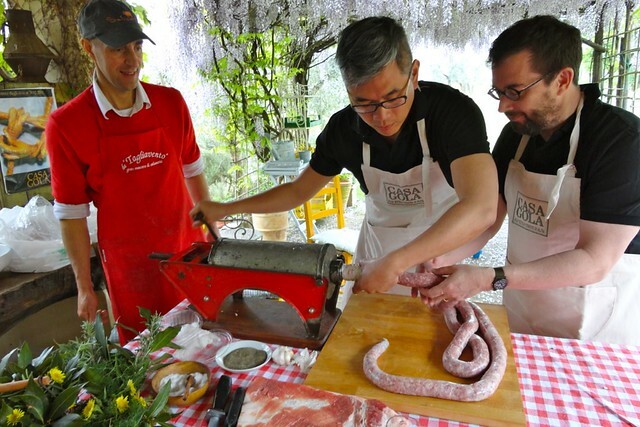 Ciascolo, most commonly from the Marche region, is instead made from finely and repeatedly ground meat and fat from the shoulder and belly, flavored with pepper and garlic then smoked. This type of salame is usually eaten after just a few weeks of curing when it is still soft and can be spread on bread. Finocchiona, from Tuscany, is a firm, finely textured salame flavored with dried fennel seeds, black pepper, garlic, and red wine. Milanese, from northern Italy, combines pork meat and fat with a bit of beef in one of the finest grounds among Italian salami to produce a very homogeneous texture. The most industrial of Italian salami, it may look less fatty than other, more rustic, varieties, but this is only because the fat and meat are so well blended. Felino, from the area surrounding the town of the same name in Emilia-Romagna, is one of the most prestigious and historic of Italy’s salami, documented as early as the 1100s. Made with only certain heirloom breeds, this flattened pork salame makes oblong slices and the coarse texture and seasoning only highlights the excellent quality of the meat. ‘Nduja is a typically Calabrian product. A spreadable mixture of pork meat and fat, roasted hot red pepper, and a number of spices, ‘nduja is the backbone of fiery Calabrian cuisine, often added to sauces or simply served as a condiment. Lardo di Colonnata, is an exquisitely delicate and prestigious product from the town of Colonnata in Tuscany. This cured fatback is flavored with herbs and spices and then left to age in containers hewed from the local marble. Once ready, the lardo is sliced thinly and served over toasted bread. Guanciale is the fatty cut of pig cheek, mostly white with a thin stripe of pink meat running through it. Brined in red wine and smoke-cured, the aromatic final product is often used to flavor sauces and soups. This cut, common to all of Italy, is the pork belly trimmed of fat, spiced, rolled, and cured. When ready, the slices are a whirl of pink and white and delicately flavored for serving with sauces and soups. Tweetable: The hundreds of different types of cured cold cuts in Italy vary according to the climate and culture of each region.